FEIXIANG Acoustic Guitar 36 inch Classical Electric Guitaris a great-looking guitar with a big, bold sound and excellent features that represent exceptional value, and features a spruce top with scalloped bracing, laminated sapele back and sides, chrome tuner keys, a good quality strings. The slim neck provide comfortable feel and excellent playability, and the smooth satin finish maximizes resonance for optimal sound quality.Tuner key is sealed tuning pegs style, alloy metal made and keep your acoustic guitar playing in tune. Enya strings combines the medium gauge bottom strings for increased resonance and volume with light gauge top strings for more comfortable playability and single note bending. The strings starts with the highest quality wrap wire materials, precision drawn and micro-coated on our advanced proprietary machinery. For new instrument, it’ll take time for the strings as well as the wood to adapt the pulling force. You may need to tune the guitar several times until the force is balanced and tune is settled. The period may last for a few days, varied from different temperature and humidity. 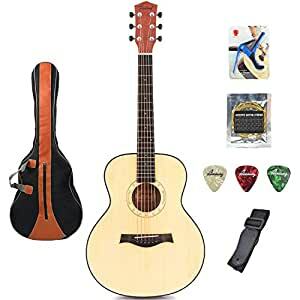 Kindly notes: Acoustic Guitar’s picks and gig bag would be sent in random colors. And the photos will have color difference under different circumstances.